Posted in Status on April 30, 2017 by erik.rasmussen@noaa.gov. 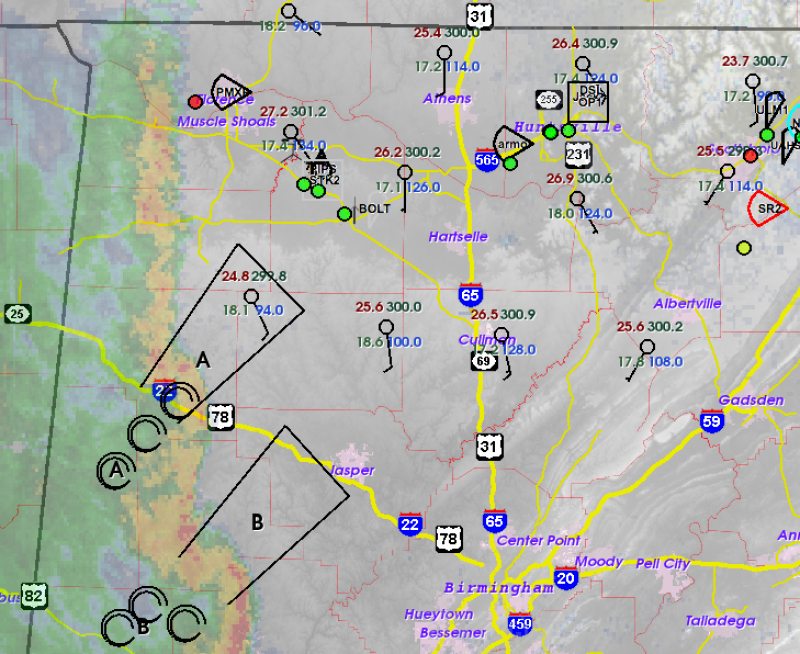 The field teams are seeing a map something like this, with the storms annotated as A and B. The Purdue and Texas Tech teams (green dots on the NW-SE hiway) are moving into position to collect data on Storm A. Other teams have been deployed on Sand Mountain in the northeast corner of this map to observe the storms later this afternoon and evening. This is the last observing day of the 2017 Spring Campaign. Our project window extends through May 8, but by the end of today, we will have exhausted most of our project resources. This may be shaping up to be one of the more interesting days of the project. An initial band of tornadic storms is racing east through Mississippi early this morning. It looks like this first line will make it through the domain by midday to early afternoon. The atmospheric profiles ahead of this line are not going to be particularly favorable for tornadoes in northern AL. But there is the possibility that this line will leave behind an outflow boundary that could retreat back north through AL toward evening. When this happens, the low-level shear could become very large, and the thermodynamic profiles may be quite favorable near the ground for tornadoes. Even with the system 12 h away, it is nearly impossible to forecast the details. So we’re excited about the potential gain of knowledge to make these events easier to forecast in the future. Our Texas Tech and Purdue research teams are already heading west toward MS, hoping to sample the cold pool and precipitation produced by this initial line. Later, they will probably retreat east or southeast ahead of the possible second round of severe convection. Our radar and profiler teams are headed to the Sand Mountain plateau east of Huntsville to get one more comprehensive data set on the evolution of flow and low-level thermodynamics in complex terrain, ahead of and during severe storm episodes. The NOAA hurricane hunter aircraft will be departing Huntsville around 2 PM and use their Doppler radar systems to study individual severe storms. And toward mid-morning we will have about 10 sounding teams across northern AL and MS sampling the atmosphere every hour or two. I will try to sneak in another blog post or two as this event unfolds. Posted in Status on April 28, 2017 by erik.rasmussen@noaa.gov. The storms failed to form so far, and there are no strong indications that they will form. So we are pulling the more western teams back in toward the area just north of Lake Wheeler, near Decatur, AL. We will spend the rest of the day observing the features that evolve in the lowest kilometer or so of the atmosphere in response to variations in land use and land cover, including lake/land contrasts. This information should be important to help folks who work on forecast models to evaluate the performance of those models. I am blogging from the SWIRLL facility at UA-Huntsville. We came in this morning for a 10 AM meeting, expecting to design a clear-air boundary layer study to look at land use/land cover variations, and lake breeze effects in the area west of Huntsville. The model guidance from yesterday generally showed our area too stable for storms. But (there’s always a BUT in VORTEX-SE)… this morning the HRRR model showed rotating storms developing over our research domain in the early afternoon. This forecast has persisted for the last 4-5 hours at least, with consistent forecasts of rotating updrafts moving across our western observing area. So, we adapted by quickly moving one sounding unit and one radar further west in case these storms form. 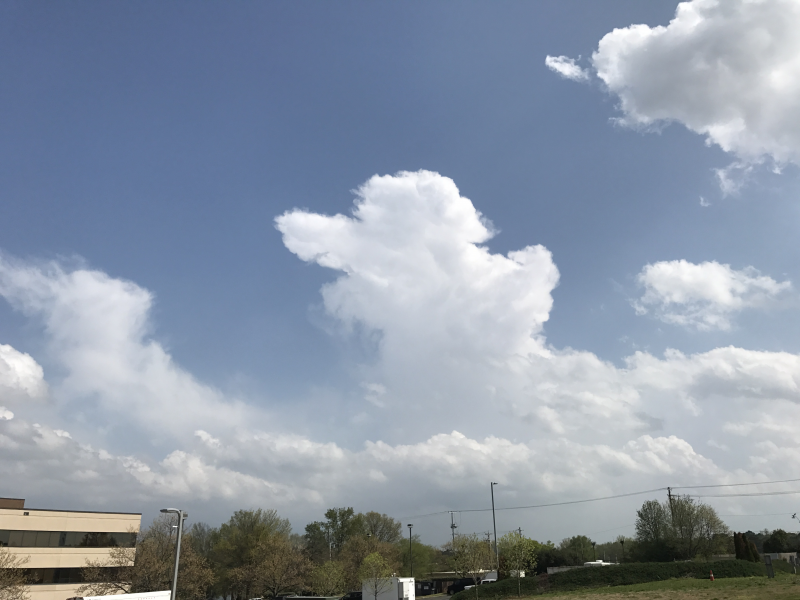 If we don’t have storm initiation in the next hour or so, we will bring these two units back closer to Huntsville, and do the “clear-air” experiment for the rest of the day. Our two western-most mobile radars are SR2 and PMXP, and their “dual-Doppler” coverage extends west out across the Florence/Muscle Shoals area. Dual-Doppler means that the along-beam velocity from each radar can be combined geometrically to compute the actual wind direction and speed at every point seen by the two radars. The uncertainty in this wind computation is smallest when the two radar beams cross at large angles, and the wind becomes very uncertain as the two beam directions get closer together. Tomorrow there will probably be no observing in the VORTEX-SE domain. Sunday continues to look like an active day. But if we have learned anything this year, it’s that these strong systems have a variety of “failure modes”. They typically look very promising for severe weather for several days leading up to the event, and then something goes awry and no/few tornadic storms occur. Posted in Status on April 26, 2017 by erik.rasmussen@noaa.gov. I have been a bit too busy to blog for a while. Basically, it’s been status quo for VORTEX-SE the last few weeks, with huge forecast difficulties costing us an event last weekend. We had decided to hold an IOP, but then we cancelled it when the numerical models suggested a very slim chance of tornadoes. But they were wrong, and there were two interesting supercells in the domain. Some of our difficulties relate to the fact that we have a domain about eight counties in size. I don’t think we would ever confine ourselves to eight counties in the Plains, and hope to learn about tornado formation in a domain of that size. And the best eight counties we’ve found in the Southeast U.S. (northern Alabama) are not very well suited to traditional tornado research. But we are back at it again. Tonight, a line of convection will move into AL from the west. Most of the models are suggesting that this line will weaken as it moves into AL, and pose only a very small tornado threat. However, the operational HRRR model shows the line breaking up, and then more discrete cells developing within the overall area of convection in northern Alabama. Some of these are forecast to have rotating updrafts. The teams are here through Sunday. So there is no huge cost to operating tonight. We may also operate on Friday… this should be a high-CAPE day with weaker shear, and little chance of storm initiation. So if we operate, we will be looking at land use and land cover influences, including lake breezes west of Huntsville. We will cross our fingers that initiation does occur close to where we are operating. And Sunday continues to look like a fairly big event, but we have learned that there are a lot of ways for these big waves to fail to be associated with tornadoes. Sunday will be the last operations day for VORTEX-SE in 2017. I will likely blog again later this evening as the line of activity moves into our research area. Posted in Status on April 12, 2017 by erik.rasmussen@noaa.gov. VORTEX-SE has been down for the last week. This is a much-needed break for the researchers, and for me. Right now, there are no hints of significant severe weather in the Southeast for the next few weeks. But eventually the current pattern, with weak flow aloft, will probably break down, and VORTEX-SE will conduct its last IOP for 2017. Last Wednesday was… well…. special. I think it’s fair to say that the project crews felt that we were finally going to get a data set that included tornadic storms, so the mood in the planning meeting was a lot less gloomy than the last few. I’m not sure how folks feel after spending a whole day, from dawn to dusk, collecting observations of yet another “failure mode” (YAFM). If their thoughts are at all like mine, I’m not sure what to hope for in the remainder of this year’s campaign! I don’t want another significant wave with tornado potential writ large. Been there, done that. Repeatedly. But I don’t want a marginal-looking situation, either. The next IOP will be our last chance, for a while, to observe Southeast storms with multiple-Dopplers, deployable surface instruments, etc. It’s been rough. Most of the project scientists have been involved in field work where the focus is intercepting tornadoes. Most haven’t really wrapped their heads around how to extract new knowledge from whatever that atmosphere offers up. And the personal costs are high: missed classes, impacts on student learning, making up lectures, families back home, arranging and rearranging travel and accommodations daily, missions that start at 4 AM, and on and on. There are mission days when we are pretty sure that there won’t be significant tornadoes even though the lead-up looked promising, and there are a few that do seem to have significant tornado potential. Last Wednesday was one of the latter. There was an SPC moderate risk in northern AL, and a high risk further south. The usual tornado forecast parameters were all in place. But the activity in northern AL was benign. The cumulonimbus clouds were fairly vigorous in the lower levels, but in the middle levels they became fuzzy and shredded. Mixing with warm dry air appeared to be evaporating them. Anvils were never solid-looking, but were puffs of ice drifting away from the updraft. Was there too much shear? Too warm and dry aloft? Not enough focus in the lower levels? Something wrong with the hodograph? On radar, the echoes were strung out along the strong upper level flow. Those few echoes that had any longevity seemed to be moving into these bands of moistened air. For the most part, the echoes were weak. And another pathology that I have not seen before: the echoes had the shape of cyclonically rotating supercells, but many appeared to have anticyclonic wind shear in the Doppler radar data. The only storm in the domain to produce a research-worthy low-level vortex did not appear to be a supercell on radar, and was perhaps enhanced by terrain effects near Sand Mountain. I’ve heard a different explanation of this day’s “failure mode” from each meteorologist I’ve talked to. This is all speculation (OK, OK… informed speculation). Once we dig into the rich set of soundings obtained by VORTEX-SE, and perhaps do some computer simulations of the overall setup as well as individual “storms”, we can move from speculation to some more solid information. This is important. As usual, I believe the forecasters in the NWS forecast offices and the SPC did just about as well as our current understanding allows. Any forecaster (this blogger included) can look at an event in hindsight and “explain” how the forecast went wrong. We can satisfy ourselves that our own comprehension of the situation was better than some other forecaster’s. And the risk here is that our self-confirmed (mis-)understanding of the event becomes the lens through which we look at future events. But we really have a lot to learn about severe weather forecasting. We do know that when a significant tornado occurs, it is probably in an environment that features a certain mix of CAPE, deep shear, near-ground shear, etc. Our climatologies show this. We have sounding analysis tools based on this understanding. But our climatologies also show us that when that certain mix of conditions is present, a large percentage of the time there will not be significant tornadoes. In other words, in these potent-looking environments, most of the time “something” will reduce tornado potential. In the last 25-30 years we have learned a lot about the conditions present when significant tornadoes happen, but we have learned little about these “somethings” that usually get in the way of tornado production. It could also be true that our most-used forecast parameters are not the most physically relevant, but instead are only reasonably well-correlated with some yet-to-be-discovered pertinent parameters, so we may be able to improve forecasting by finding more reliable forecast parameters. I was involved in some of the early research to identify the environmental conditions that are present when significant tornadoes occur. And I look forward to the day when researchers can show how my early work was off the mark, and the old ideas can be discarded. Over time, researchers will probably increase their focus on the “failure modes”, and we will learn to recognize the factors that reduce tornado risk. This may be one of the bigger short-term contributions of VORTEX-SE. We certainly have a rich palette of observed failure modes to study! P.S. The psychological and social aspects of this event, and VORTEX-SE in general, are worthy of a lot of blogging. In many ways, they loom a lot larger than the meteorological aspects. I hope I can convince some of my colleagues and VORTEX-SE researchers to share some of their insights and perceptions in this blog someday soon. Posted in Status on April 5, 2017 by erik.rasmussen@noaa.gov. This map shows where our teams are deployed today. Elevation ranges about 200 m (darkest green) to above 600 m on Sand Mountain (pale green). Small color-filled circles are our research deployment sites. Huntsville AL is on the west edge, so this map covers all of northeast AL. Sand Mountain is that broad swath of gently rising terrain that extends out of the northeast corner of the state. The river on the west edge of Sand Mountain is the Tennessee River, flowing southwest until it turns back northwest toward Huntsville. This area is a good natural laboratory for looking at the influence of terrain features on the small-scale environments of storms, with very rough terrain just northeast of Huntsville, the broadly sloping Sand Mountain plateau, and a similar feature called Lookout Mountain further southeast. There is a big variety of land use here, including cultivated agriculture, dense forests, large lakes/rivers, and large urban areas. The first round of storms is moving off into Georgia, and now we await more significant supercells from midday through late afternoon. Operations have begun this morning, with teams hitting the road around 5 AM. 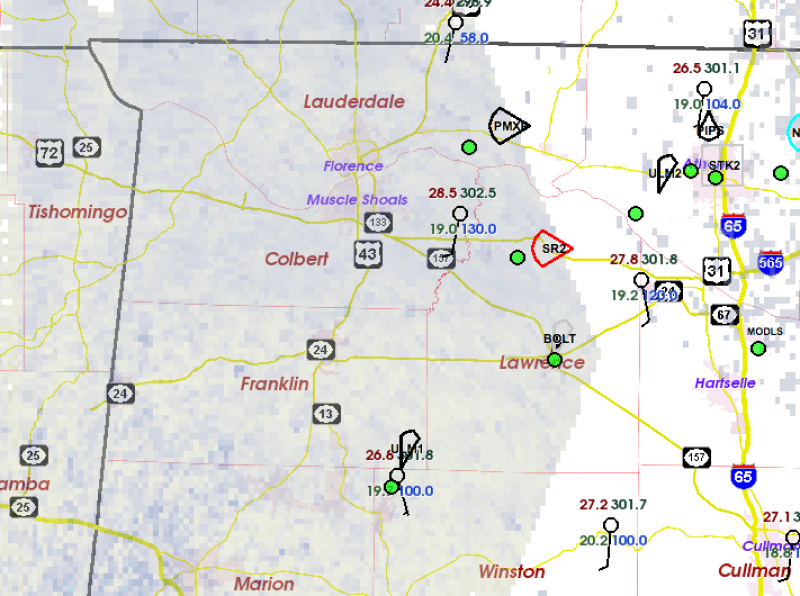 We have just launched about a dozen 12Z soundings across N AL and MS. Elevated convective cells with a few lightning strikes are moving into the southern part of our domain. At this time, it is very uncertain how these cells will influence the surface weather map. They are likely to leave behind a pool of cooled outflow air somewhere across the N 1/2 of AL, and this could be a focus for higher tornado potential later today. Our teams are deploying to what we call the “eastern domain”, focused on Sand Mountain, a gently-sloping plateau in northeast AL. We will have a network of 4-5 mobile Dopplers scanning throughout the day in this domain. We are choosing this domain because it has looked like it has the highest probability of tornadic supercells through the day. It should be a very busy day here in the Ops Center, so I am not sure I will blog again. Posted in Status on April 4, 2017 by erik.rasmussen@noaa.gov. I’m still in Huntsville. My one attempt at getting back to my desk, and my boxer, failed when I flew to OKC (two attempts), and had to drive straight back to Huntsville. We don’t define success as the number of tornado deployments vs. the number of null deployments. We define success based on the amount of new knowledge we can generate that improves our understanding of tornado environments, and the predictions of the weather associated with those environments. No doubt the mood of the researchers sours a lot in these null cases, but by and large we know that we have to be here observing the null cases to have any hope of observing the tornado cases. Back to the weather. We deployed yesterday in western AL and watched some micro-supercells move toward the network from MS. I will probably be skewered in (Anti)Social Media for calling them that, but these cells were persistent, had low-level rotation, and even modest lowerings. They were only about 15000 feet tall, and didn’t make any cloud-to-ground lightning. So, scientifically fascinating, but not much of a threat. Now we turn our attention to tomorrow. In general, our numerical forecasts suggest a large enough risk for tornadoes in our domain that we must operate. That’s about the best we can usually say 1-4 days in advance. VORTEX 94-95, VORTEX-2, and VORTEX-SE have shown us that there are a lot of ways for the atmosphere to bust a tornado forecast, and only a slim chance that all ingredients will really fall into place. But we will be deployed, and we will be doing everything we can to learn more about the factors that raise or lower tornado potential in otherwise favorable-looking scenarios. Posted in News on April 1, 2017 by erik.rasmussen@noaa.gov. We just finished a fairly lively discussion of the system that is approaching for early Monday. It highlighted a lot of the issues we deal with in VORTEX-SE. Of course, the first thing we try to assess is tornado potential, because if there isn’t at least some potential, there’s not much point to operating. It looks like there will be very favorable hodographs in our domain on Monday. The question is: will there be CAPE? It almost certainly will be low CAPE (< 500 J/kg). There was a lot of debate about whether potentially buoyant air would move this far north ahead of the early-Monday system, and debate about whether the air mass could recover after this first round and give a second round of storms later in the day. I think it’s a reasonable hypothesis that tornadoes can occur in nearly zero CAPE as long as the updraft, augmented by the upward forcing associated with very strong environmental wind shear, can extend near the ground. So after a round of discussion, the researchers generally felt that this is a system we need to look at. One of the most important items of discussion was a comment made by one of our researchers to the effect of: “Isn’t this exactly what VORTEX-SE is about? The more uncertain situations, and the low-CAPE high-shear situations?” In a broad sense, these are exactly the situations we need to target. The obvious tornado situations are not a big problem in the Southeast… they are well-handled. So as discouraging as busted deployments can be, and as much as everyone would like to observe a tornadic storm, VORTEX-SE has an overriding obligation to develop knowledge to reduce the uncertainty in situations just like the one we are facing Monday. And this mix of the role of uncertainty, biases, and recent experiences on decision making has to be pretty interesting to our Social and Behavioral Sciences researchers. In a broad sense, our whole social sciences emphasis can be boiled down to how humans, from the forecaster all the way to members of the public, make decisions in the face of uncertainty.